Using Outline Stamps Without Intricate Coloring – Waffle Flower Blog Hop + GIVEAWAY! Happy Thursday, all! Today’s post is part of a blog hop celebrating Waffle Flower’s latest release! 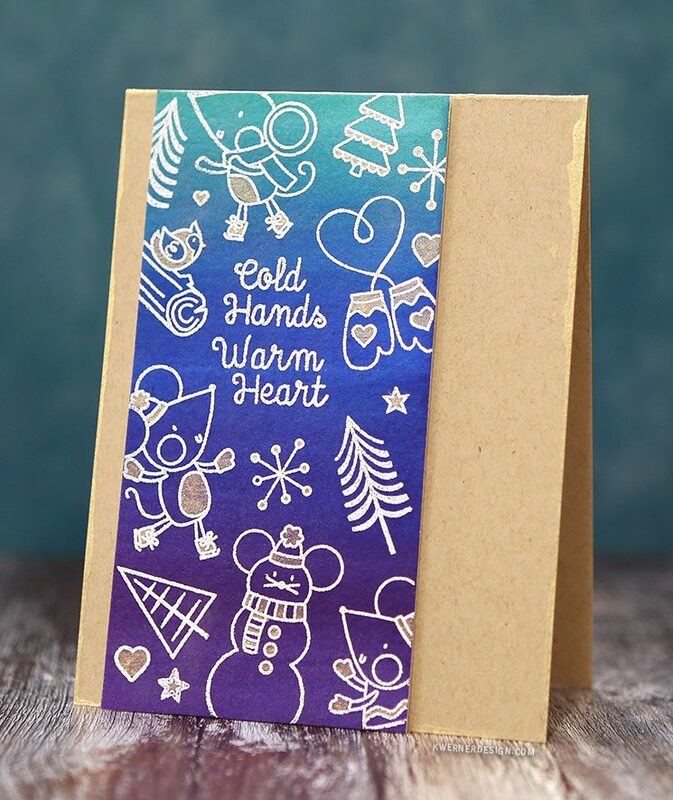 I got to play with a few of the new stamps and dies and wanted to show you a way to use outline images without a lot of intricate coloring. For the color behind the stamped images, I first painted an ombré or gradient color using my favorite watercolor palette, the Mijello Mission Gold 36 color palette. I used Strathmore cold press watercolor paper. After the painting, I trimmed down the watercolor paper to a more narrow strip, and then stamped my greeting in the center using VersaMark Ink. I applied some Hero Arts White Embossing Powder, and heat set it. 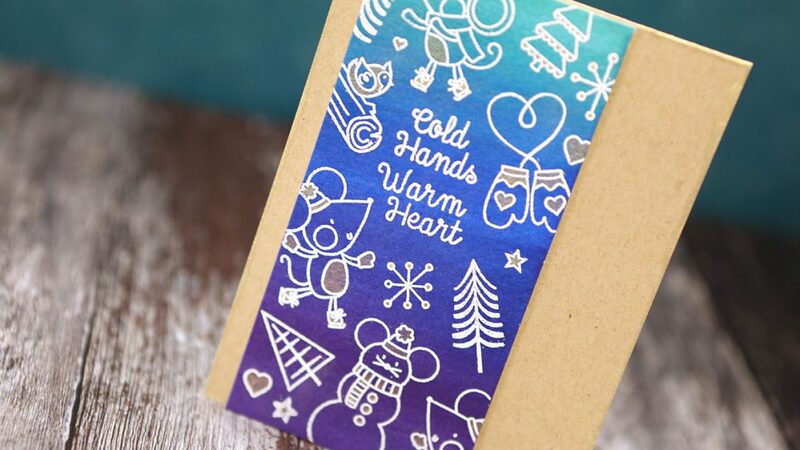 Then I stamped and white embossed nearly every image from Waffle Flower’s Cold Hands stamp set around the greeting area. (This is an awesome way to use lot of cute images all at once). To accentuate the images, I painted small areas using gold watercolor paint from Kuretake Zig’s Starry Colors palette. Then I mounted the watercolor piece onto a card base made out of Neenah Desert Storm card stock. As I mentioned above, today’s post is part of a blog hop celebrating Waffle Flower’s latest release. Be sure to check out the entire release! 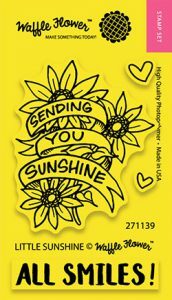 Also, to celebrate the new release, all orders over $25 placed by 11:59pm ET on Monday, October 9, 2017 with code SUNSHINE will receive a free Little Sunshine Stamp Set. The stamp set needs to be in your cart for the promo code to work. Limited 1 per customer; While Supplies last. Waffle Flower is giving away five $25 gift certificates to randomly selected commenters throughout the blog hop. That means you can increase your chances of winning by commenting on every blog post on the hop! Just comment on my blog post (and all the others, too!) by 11:59pm ET on Monday, October 9, 2017 for your chance to win. Winners will be chosen at random from the comments left on all of the posts and will be announced on the Waffle Flower blog on Wednesday, October 11, 2017. Your next stop on the hop is the wonderful Yana Smakula!